Coming home after a long day, a weekend away, or where-ever far you’ve been, you deserve a quiet place to regroup, recharge and rejuvenate. What better way than to dive nose-first into this cool and collected place of your own. Rest easy with vibrant tranquility and charm. Mikkel’s minimalism is a landscape for your spellbound night ahead. 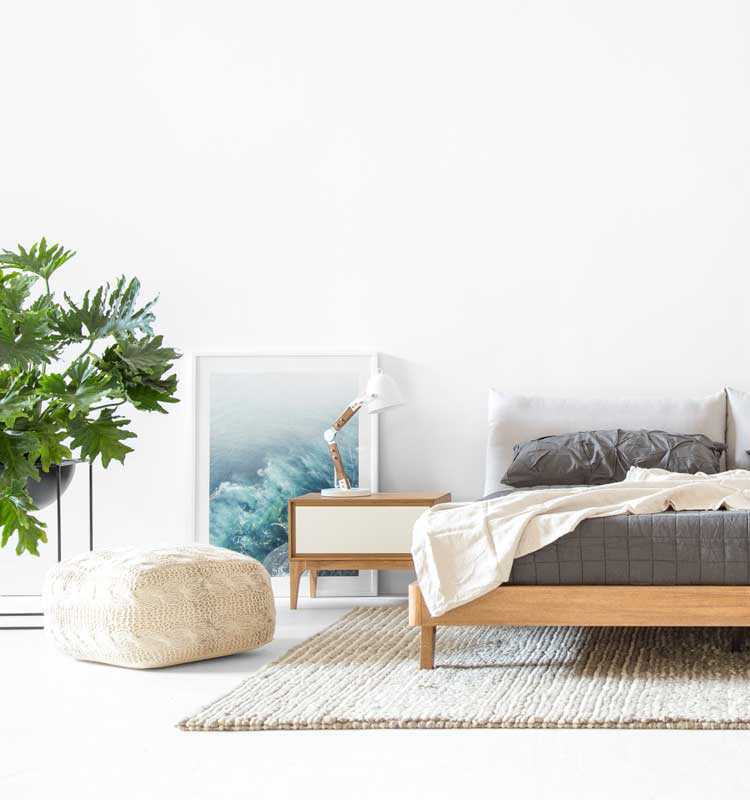 Simple and subdued, the Mikkel wood frame and soft upholstered headboard is carefully handcrafted with no added width or grandeur. The simple, industrial allure of this modern table lamp offers an excellent accompaniment to the rest-easy bedroom, what not with a wide brim for steady light and a flexible arm to welcome brightness in exactly as you wish. A sufficiently sturdy side table with small design details like etched grooving and soft angles make Joren a minimalist dream. Hide away your worries in the soft-close sliding drawers and enjoy the calmness of the night. A playful and practical piece, Sonje brings home a natural essence to the modern bedroom. With handmade qualities borrowing from the peaceful lands up north, you are sure to bask in wondrous delight tonight. Rest easy with easy breathing, where nothing beats the embrace of plant life inside the home. The fresh greens will revitalize your soul and ready you for the night. This metal planter is simple and stylish and perfect for your photosynthetic dreams. Rest easy now with this cool and collected place of your own.